“The book of the genealogy of Jesus Christ, the son of David, the son of Abraham” (Matthew 1:1 ESV). That’s an interesting way to begin your version of the greatest story ever told! Actually, it’s a pretty boring way to begin the story if you ask me. Do you want people to read your gospel? Give them something more interesting than a family tree. 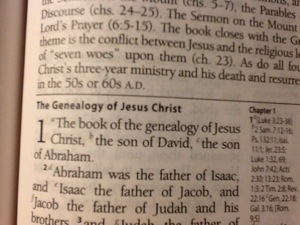 As I did a little more research, I learned that the word translated “genealogy” here sounds just like the word genesis. It’s all about a beginning. The Bible begins with the words “in the beginning,” and the New Testament begins with the beginnings of Jesus Christ. Now this will be interesting. How does the story, the history, or perhaps even the biography of Jesus begin? A descendant of David will be royalty. Jesus is a king. A descendant of Abraham will be a child of a the covenant. Jesus will be the ultimate fulfillment God’s promises. A descendant of David will be on the throne. A family will bring blessing to so many. It all comes to a head in Jesus. Just as Genesis was a beginning, so Jesus is a new beginning. “In the beginning” God created. Now, we experience a re-creation, a re-birth, a re-generation in Christ. If anyone is in him, he is a new creation (2 Cor. 5:17). This sounds like a book about new beginnings. I’m curious. I want to read more. This entry was posted in Devotions and tagged devotions, Matthew. Bookmark the permalink.